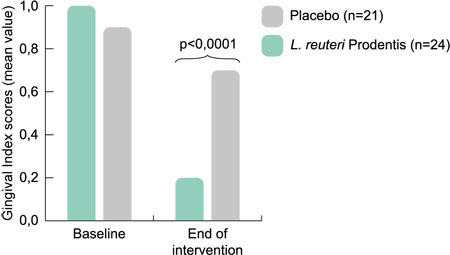 A randomised, double-blind, placebo-controlled study in 93 children diagnosed with functional abdominal pain showed that L. reuteri Protectis reduced both frequency and severity of pain compared with a placebo. 'According to the results, physicians facing the common and challenging problem of functional abdominal pain in children might suggest the use of L. reuteri Protectis as an accessible way to relieve pain intensity and reduce its frequency,' says Professor Zvi Weizman from the Paediatric Gastroenterology and Nutrition Unit, Soroka University Medical Center, Faculty of Health Sciences, Ben-Gurion University, Beer-Sheva, Israel. After 4 weeks of intervention, the number of pain episodes were almost halved among the children supplemented with one chewable tablet per day of L. reuteri Protectis compared withthe placebo group. The severity of pain was also significantly reduced in the probiotic group compared with the placebo and this effect persisted during the follow-up period. 'Stomach pain is common among children and often affects the child’s daily life through, for example, anxiety and school absenteeism. It is therefore very gratifying that this study, which confirms earlier results with L. reuteri Protectis, shows that BioGaia ProTectis could offer these children an effective, safe and easy option,' says Axel Sjöblad, Managing Director, BioGaia.